While most phone manufacturers are trying to offer the latest and greatest smartphones to consumers, LG recently launched something rather different in Korea called the LG Gx. It comes with a 5.5” Full HD IPS display and beneath the phablet-sized screen is a Snapdragon 600 processor with 2GB of RAM on board. Sounds familiar? The LG Gx is like a slightly upgraded version of the LG Optimus G Pro, with a faster processor speed clocked at 2.6GHz as opposed to 1.7GHz on the G Pro. It also packs 4G LTE connectivity on board but apart from that, everything else beneath the hood seems identical to the G Pro – 13MP front camera, 2MP rear shooter, 3140mAh removable battery, and 32GB of internal storage that is expandable via microSD card slot. 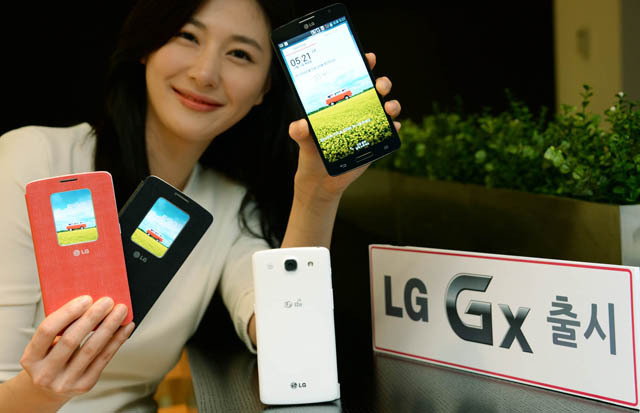 As for software, it runs on Android Jelly Bean with some of the latest LG features on board like Smart Day (a LG lock screen that shows the time, weather and appointments), QRemote and LG KnockOn. The LG Gx will be launched in South Korea in early January for 850,000 to 890,000 Korean Won (approximately RM2,700), that’s pretty darn expensive if you ask me, especially considering that the G Pro was launched here for only RM1,888. No words have been mentioned regarding international availability but if LG does launch it out of its home country, will you be interested in the LG Gx?